Welcome to Day #12 of South American Chocolate Weeks. 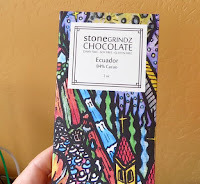 The Ecuador 84% Cacao bar from Stone Grindz Chocolate (Scottsdale, AZ) was a darker version of yesterday's Ecuador 70% Cacao bar from the same maker. Today's 84% bar had a more acidic, slightly bitter, earthy aroma than yesterday's 70% bar, and lots of uniformly bold dark flavor with minimal sweetness and fruit (pink grapefruit). A few squares will satisfy.